Our ‘Off the M8‘ series is intended to make your journeys across Ireland far more interesting! 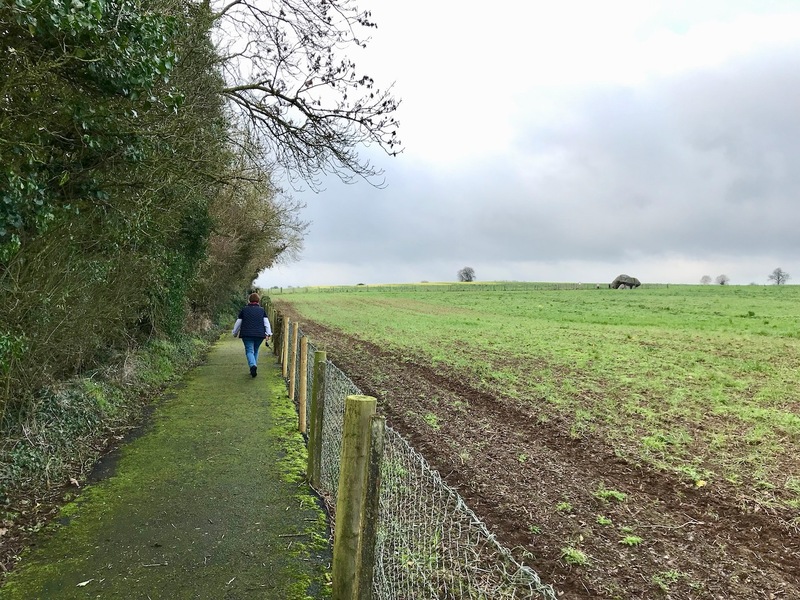 We travel between Cork and Dublin fairly regularly and, each time, we determine to search out something new. It may be an aspect of medieval history, architecture, stained glass or – as in today’s example – archaeology. How far you want to stray from the ease and directness of the motorway in your explorations is entirely up to you. This diversion will add about forty minutes to your journey: you will leave the M8 at Junction 3, head across to Carlow on the R430, and then, after Carlow, meet the M9 at Junction 4 and continue up to Dublin. 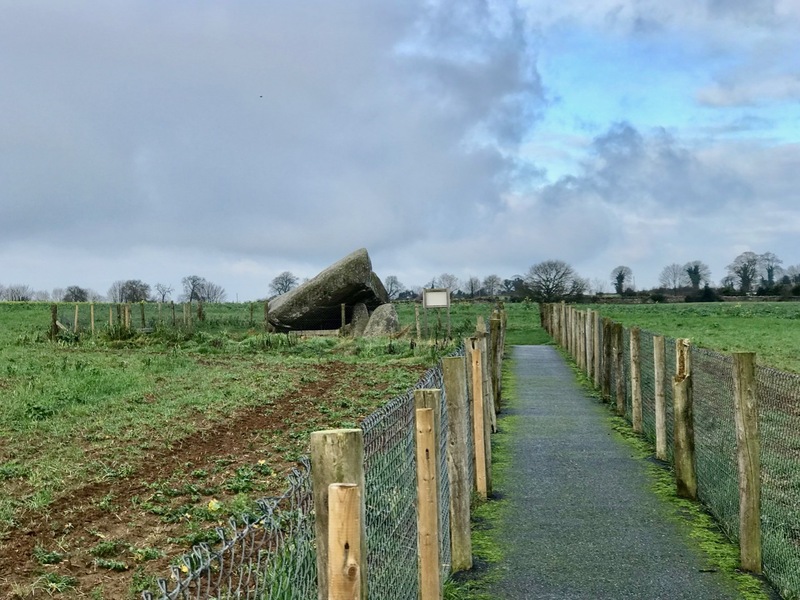 You’ll have to take a little diversion east out of Carlow on to the Hacketstown Road (R726) to find today’s destination: the largest prehistoric portal tomb in Europe, and perhaps in the world!
. . . A single, short chamber formed by two tall portal-stones, two sidestones and a backstone. Sometimes a stone between the portals closes the entry. The chamber is covered by a roofstone, often of enormous size, which slopes down from the front towards the rear. Cremation was the preferred burial rite and these date to the Neolithic from 3800 to 3200 BC . . . 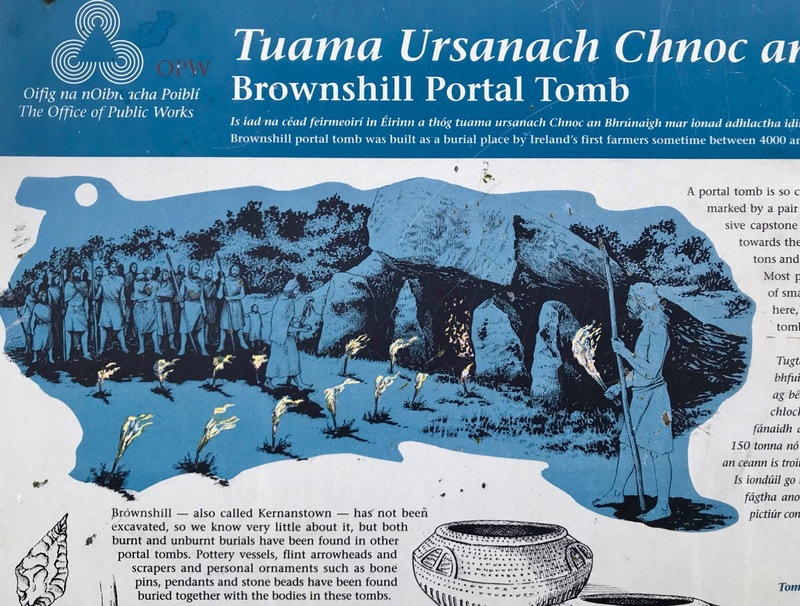 In the Barony of Carlow, in the Townland of Kernanstown, and Parish of Urghin, two miles E. of Carlow, to the N. of Browne’s Hill, or Browneshill House, also called Mount Browne, are three dolmens. The largest of the three is marked Cromlech in Ord. Surv. Map No. 7. 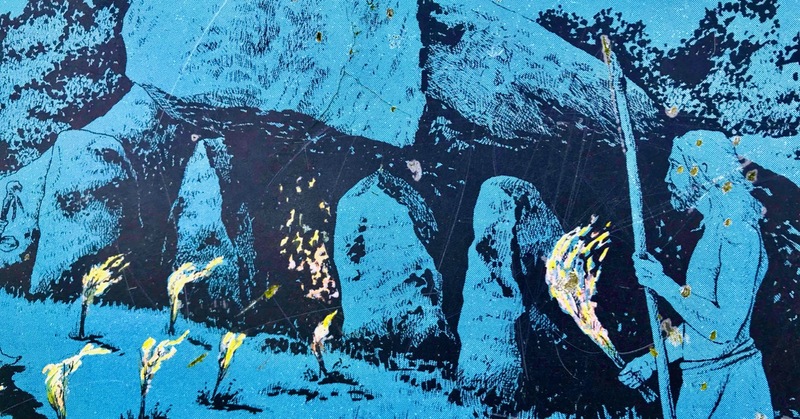 There are three dolmens on this hill. One is of enormous proportions, the two others are smaller. The former has been described by Ryan, Ledwich, and G. Du Noyer. 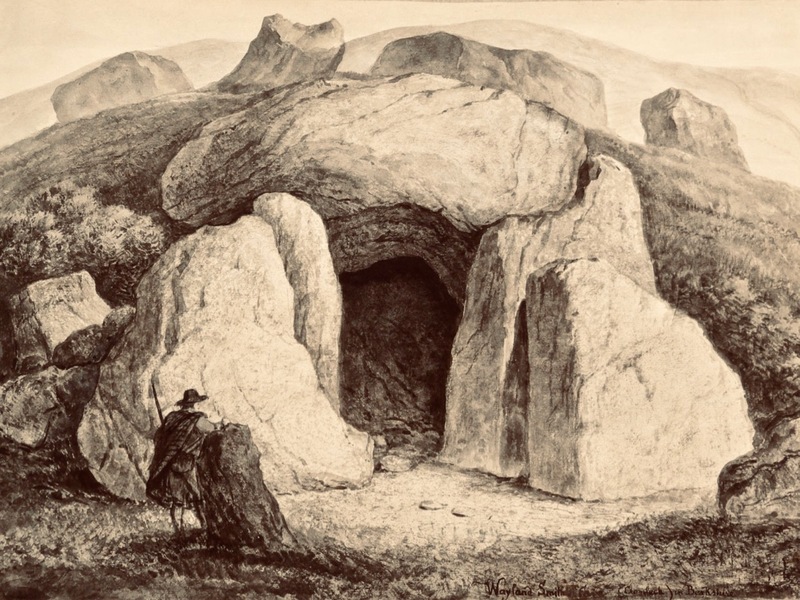 Of one of the latter there is a drawing and plan in Miss Stokes’s collection of drawings of dolmens. The remaining one is situated a distance of 50 yards to the N. of the latter. 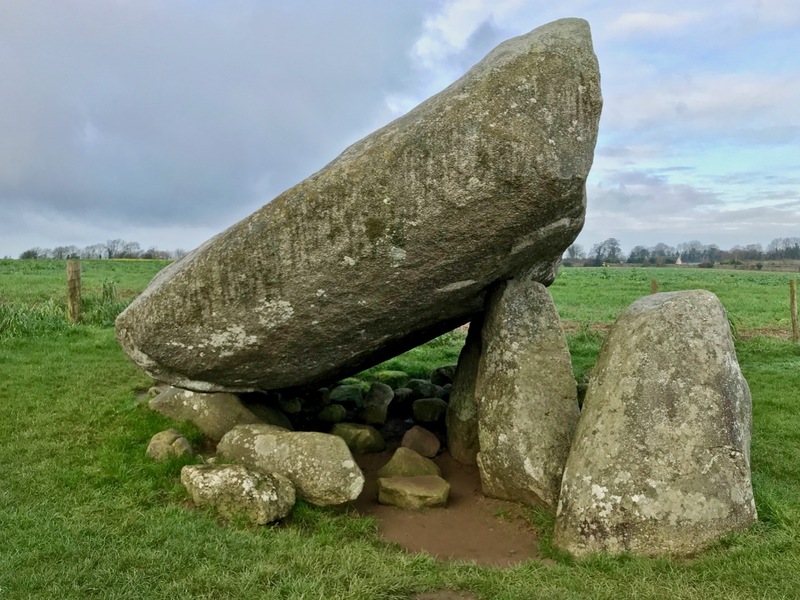 The great dolmen stands in the centre of a large flat field in permanent pasture, and has no trace of a bank or cairn near it. It consists of a splendid block of granite, the longer axis of which is N. and S., raised at an angle of 35 degrees to the horizon, upon four blocks, three of which, pillar-like, support the E. side, at a height of 6 feet above the floor, while one sustains its lower and W. side, at a height of only about 2 feet above ground. The following are my measurements of the block thus elevated into position: Superficial measurement from N.E. to S.W., 23½ feet; ditto from N.W. to S.E., 22 feet; girth 65 feet; thickness at W. side, 6 feet; at S. side, 5 feet; at E. side, 6 feet; and at N. side, 4 feet. 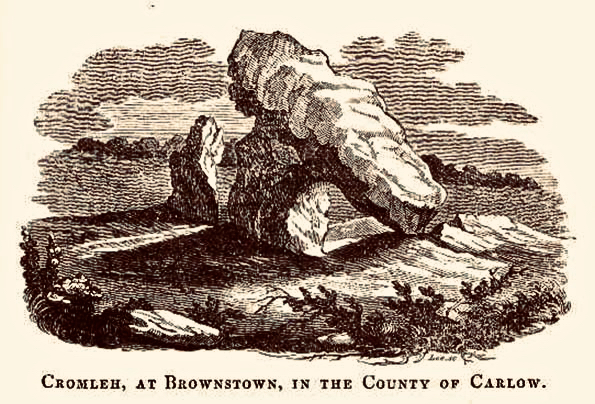 There is no ‘Brownstown’ in County Carlow, so it is likely that this engraving (above) is another version of ‘Brownshill’. 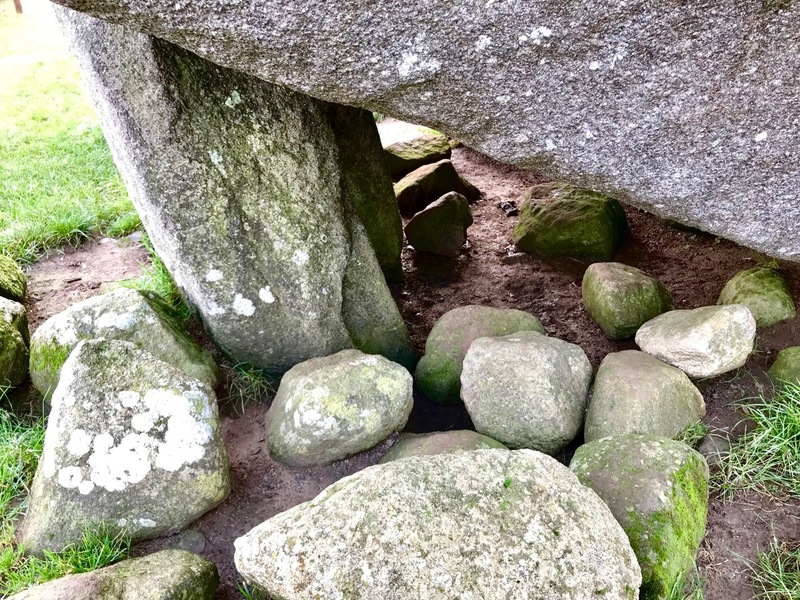 It’s hard to see in this the portal tomb we have been describing, so it is possible it is an image of one of the other ‘lost’ dolmens. There is no further information attached to this illustration. 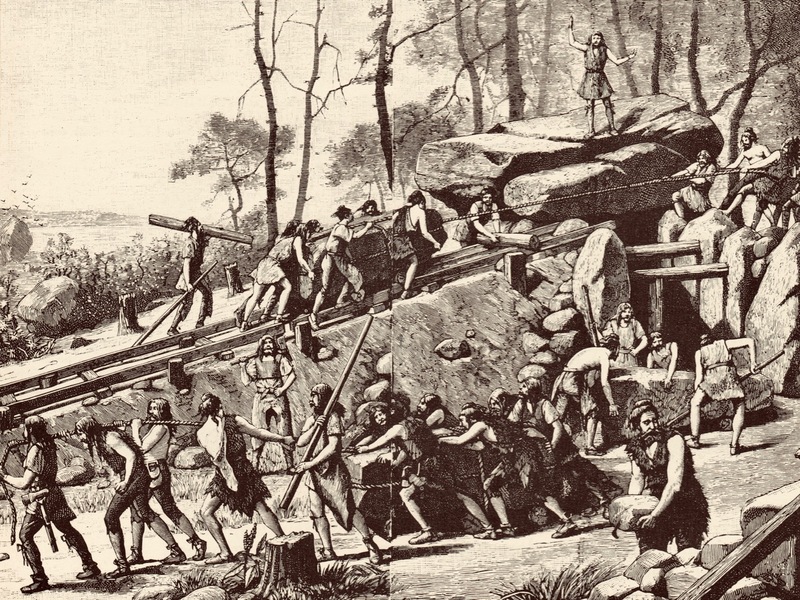 Celtomania is an expression which has been used by some antiquarians to describe the use of megalithic structures by ‘Druids’ and ancient races for ritual purposes. 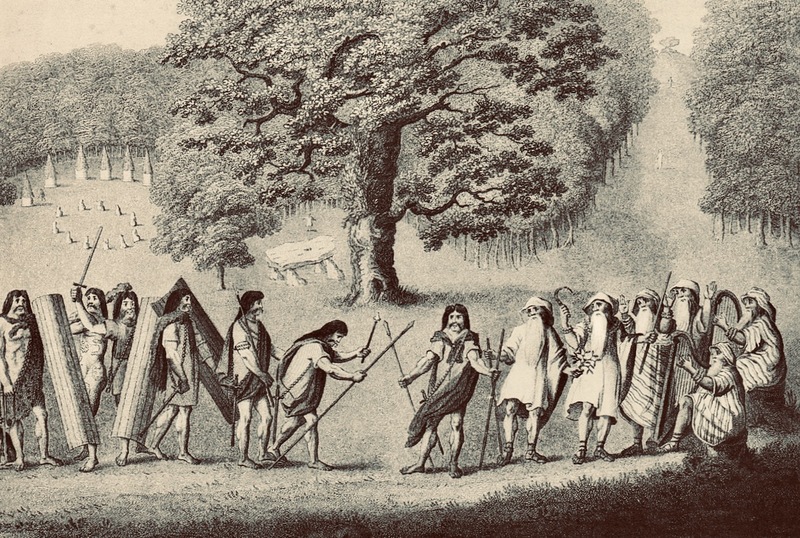 This fanciful scene by Edward King (above) shows ancient warriors, sickle-wielding and harp-playing druids, oak trees and standing stones – and a ‘dolmen’. 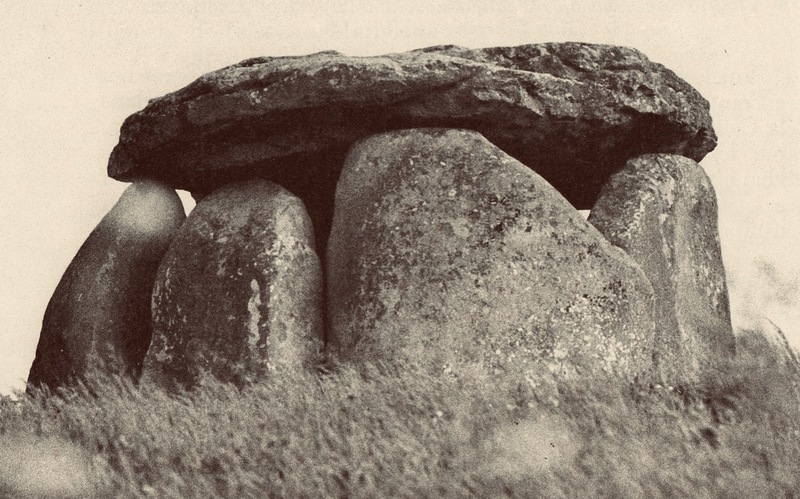 It is taken from a 1969 book on megalithic structures in Brittany which I purchased in my travels there in the 1970s: Carnac ou les mésaventures de la narration by Denis Roche. 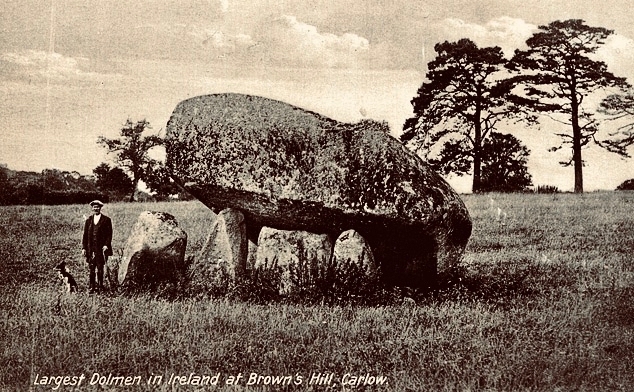 The structure at Brownshill, County Carlow must surely be one of the wonders of the megalithic world. It’s hard not to think that the sheer immensity of the raised capstone would require it to be seen so that the labour involved in its construction is appreciated. These stone edifices were the earliest architecture in the world of our settled ancestors, and the first examples of engineering prowess: one of the reasons for their existence must have been the demonstration of power and knowledge. 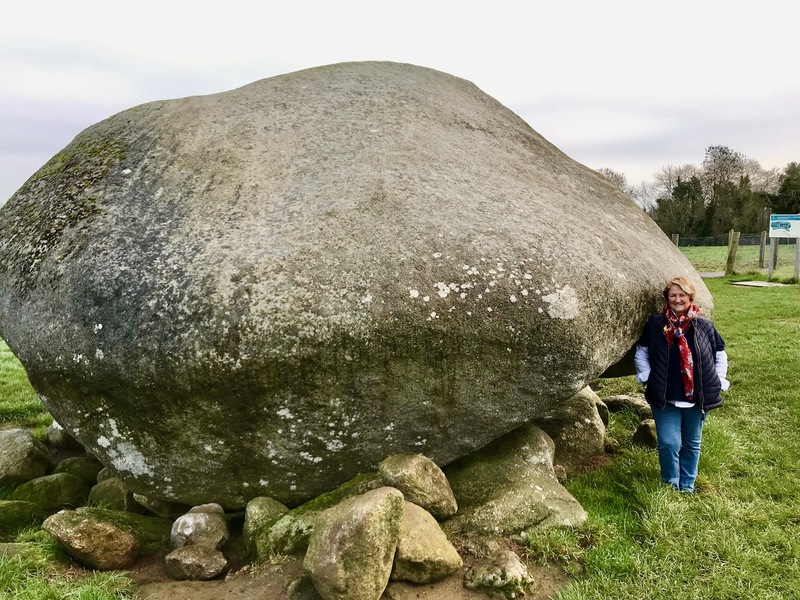 Above – a dolmen in Brittany (where they are still known by that name!) demonstrating a reversal of the principles of construction at Brownshill. 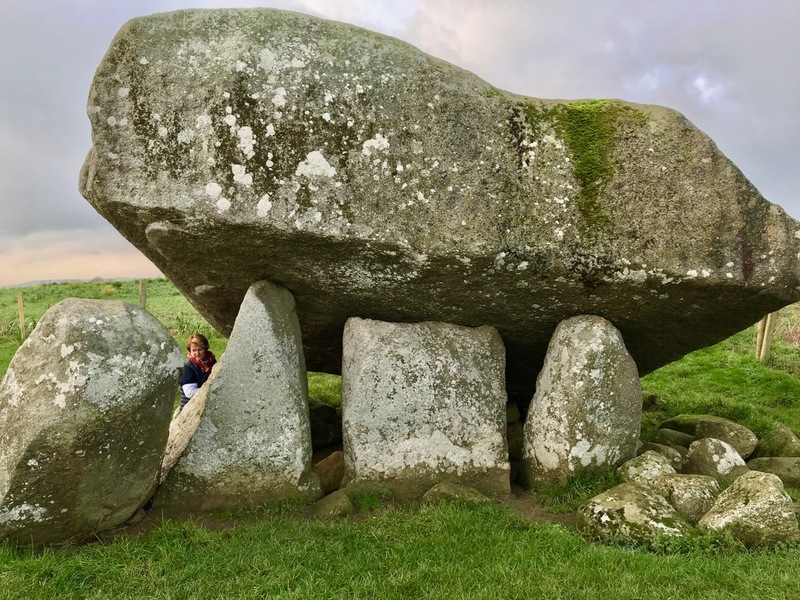 In the Irish example, the huge capstone is supported by comparatively slender uprights; in France the capstone, although also substantial and heavy, sits on very large portal stones. The result is visually impressive in a different way. 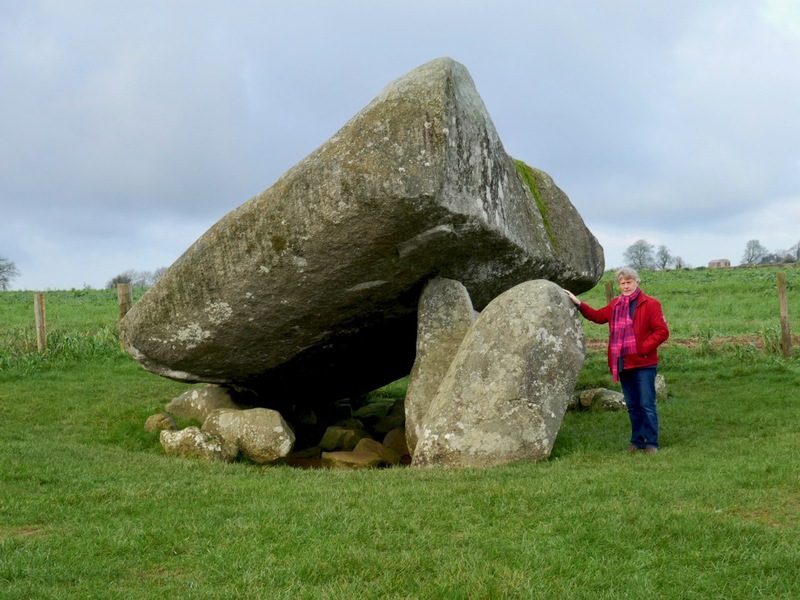 Here in Ireland there are many more examples of portal tombs waiting to be visited and reported on: they are on our list.